I am a lover of Mamey Sapote and Green Sapote because they taste very much the same. The Mamey and Green Sapote are fruits, which in all probability originated in Central America. They are true members of the Sapotaceae family - true Sapotes and a lot of these other fruit like the White Sapote, South American Sapote are not in this family. They are in a group of trees characterised by their milky sap. Other important fruits within this same family are the Caimito or Star Apple, Sapodilla, Canistel, Abiu and the Miracle Fruit, so it's a very, very important economic family of rare and tropical fruit. The Mamey and Green Sapote have many common names, depending on which country you happen to be in and they also have a great long list of Latin names. The Mamey Sapote is the more common of these fruits and it's often confused with a tree called the Mamey Apple or Mamey americana, which is a relative of the Mangosteen and grows in the same areas as the Mamey Sapote. 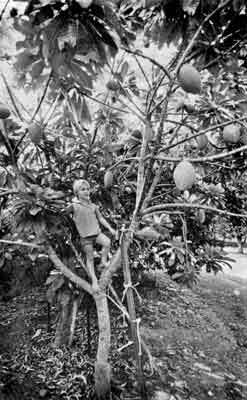 The Mamey Sapote is distributed throughout the coastal regions of North and South America, all through Central America and has been transported through the Pacific into the Philippines. The Green Sapote on the other hand, is almost entirely restricted to its native habitat which is the highland areas from Southern Mexico through Guatemala down into Costa Rica. More recently trials have been planted in Florida and now Australia. The name 'Sapote' is basically from a main word 'Zapott' which just meant fruit and the Mamey Sapote and Green Sapote are such revered fruits that when forests were cleared these trees were left standing. When Cortez and his army marched through parts of Central America there were times when they existed entirely on Mamey Sapote pulp - so it's a highly nutritious fruit. We'll go into the botany of these plants which will explain the differences between the two species. Botanically, they are very similar, both being large evergreen trees which rival the Durian and the Mango as being some of the largest fruit trees - they reach 30 metres. The leaves are large, up to 300 mm long and clustered on the terminals of the branches and below these leaves on the older wood soft yellow flowers appear in large quantities. The flowers just stick up above the bark and are fairly perfect in that they have male and female parts. They have five sepals, five petals, five stamenoids and a single pistil with five carpels. There is a problem of cross pollination within the whole Sapotaceae family, incompatibility between plants and pollen sterility. However, there are many plants and especially the grafted varieties of selected clones, which have perfect flowers and fruit entirely on their own. The fruits are actually a berry, and I believe they might be the largest berry fruit in the world. The major difference between these plants is the fruits. I will explain some of the differences. FRUIT brown skin, scaly, 500-2500 g. Some cvs. fibre. 12-18 mos. ripen, larger seed, 80-200mm diameter, 60-120mm diameter. green skin, smooth 200-500g little fibre. 10-12 mos. ripen, smaller seed, 50-100mm long 40-90mm diameter. YIELD up to 200 kg ? In the fruit form we have a brown skin on the Mamey Sapote and a green skin on the Green Sapote. We have a scaly type skin on the Mamey and a smooth skin on the Green Sapote. The Mamey Sapote is quite large, up to 2.5 kg and the Green Sapote is much smaller, up to 500 gm. The Mamey Sapote have some cultivars with fibre but the Green Sapote have very little fibre. The Mamey Sapote has a much larger seed than the Green Sapote. To give you some indications as to the size of these fruits Mamey Sapotes vary from 80 mm to 200 mm long and Green Sapotes 50 mm to 100 mm and consequently the widths vary too. The Mamey Sapote yield is recorded to reach 200 kg but often does weigh less, but I have no data on the Green Sapote although they are known to bear reasonably well. One of the main differences, other than in the fruit, is the flowers and the leaves. The flower on the Mamey Sapote has broad ovate anthers and the Green Sapote has smaller different-shaped sepals and shorter stamenoids and stamens. The leaves of the Mamey Sapote are large and dark green and this is one way of identifying the plants. The Green Sapote has smaller leaves which are silver and downey underside and little like fur. These trees can be deciduous under stress and lose the leaves with new flushes so if your leaves drop it could be under stress or it's about to put out new leaves. Generally the fruit have 1 to 3 seeds, the better selected clones have only one seed and there is a greater variation in each of the different species. There are two different common cultivars in the Mamey Sapote - these are Pontin and Magana. Pontin has a fruit size of about 120 mm - 150 mm and 400 gm - 800 gm, whereas in Magana it has fruit of 150 mm - 200 mm long and 600 gm - 1500 gm, some of the fruit reaching weights of 2½ kg. I give Pontin a plus because it is a smaller fruit and will be easier to market. We have very different flowering to fruit-set time between the two. In the Pontin we have 18 months and the Magana 12 months. Maturing time from grafting a seedling to fruit, we have 4 - 5 years with the Pontin and 2 - 3 years for the Magana. This gives a definite plus to the Magana in the last two characteristics. The Pontin has a higher yield than the Magana. The actual fruiting times differ as well so in Australia with different varieties we will be able to have an extended season. They will fruit all year round but will have major peaks. The major peak for the Pontin is January to February and Magana November to December in Australia. The flesh colour is pale salmon in the Pontin and the Magana has a salmon red, a much prettier, deeper colour. The colour is very important for marketing. Both these cultivars are very sweet, but there is less fibre in the Magana. Most connoisseurs of Mamey Sapote prefer to eat the Pontin and generally there is only one seed in each of these cultivars. We have other cultivars in Australia - Cuban No.1 and Cuban No.2 and Benny. They are still in the development stage and I think that Pontin and Magana might be the better ones. In the ecology of these two fruits we find that the Mamey Sapote comes from the moist tropical lowlands and the Green Sapote from the sub-tropical moist highlands at an altitude of between 1,000 to 2,500 metres. This is one of the benefits of these two different species, that they can be grown in a very wide part of Australia. They prefer a pH of about 6 to 7 but they have been known to tolerate quite high alkaline soils up to 8.4. They come from quite reasonable rainfall areas above 1,500 m up to 4,000 m and one of the main attributes of having both these trees in Australia is that they fruit at different times. November to March is the major Mamey Sapote fruiting season and June to September for the Green Sapote. Neither of these plants can stand frosts while young, however light frosts don't seem to bother them, more so as the tree gets older. The Green Sapote is slightly more tolerant than the Mamey Sapote. Both species grow on a wide variety of soils from clay to sandy loams but drainage is important as these plants suffer from root rot. A deep humus soil is preferred. With regard to the propagation of Mamey Sapote and Green Sapote, most of their lives they have been propagated almost entirely by seed and it is still probably the most popular way. However with the flowering in the Sapotaceae family it can't be guaranteed of good fruit set or in fact true-to-type characteristics from planting a seedling. Seedlings take much longer than a sexually propagated tree and they have far greater genetic variation. Propagation by seed will always be necessary as there is a need for root stocks, and if you remove the hard seed coat which surrounds these seeds, germination is rapidly increased. Grafting is the main way of propagating these trees, and inarching is the most favoured way. They are a difficult tree to graft; it is thought this is due to the fact that the pores in the wood are so small that it actually restricts the flow of water in grafting. Depending on the availability of root stocks, Green Sapote can be grafted onto Mamey Sapote and this is the way it is done in Australia and Florida, as Green Sapotes are far less plentiful. Budding, side veneer and cleft grafting are other ways of grafting and the results are much higher if the scion material is girdled in Autumn and left to swell to about two times its natural size and then grafted in the spring. If you do this with juvenile wood you will get much better results than with mature wood. Grafting under conditions of warm days and cool nights seems to be preferred. Trials have been done with cleft grafting leafy scions into tender terminals of trees 2 - 3 years old and placing them under intermittent mist, with good results. At this early stage of a seedling's development some of the tissues are still undifferentiated and the graft can draw nutrients and the seedling can draw nutrients from the remaining seed. Marcots and cuttings have been successful but they are not recommended because they don't give very healthy plants. The root development is not the best. With regards to the cultivation of Mamey Sapote and Green Sapote, they are very large trees and should be planted at about 10 m x 10 m to 14 m x 14m spacings in a frost-free area. The young tree should be gradually introduced to full sun and provided with wind protection. Basically what this means is "the better you look after the tree, the better it's going to perform for you". If the soils are heavy it is important to provide good drainage, and mounding is advisable. With fertilising, a basic formula of about 10/10/10 NPK to 14/14/14 NPK is suitable and that should be applied about two or three times a year, up to 500 g for every year old the tree is. When the tree gets a bit older and is ready to fruit you can change that formula to about 10/10/10 and increase the p in it and possibly the k as it will help reduce the nitrogen for foliage and help in the fruit set. You also use dolomite and trace elements, minor elements as necessary. The Mamey Sapote and Green Sapote are beautifully-shaped trees, lovely to look at, and their leaves come out in whirls at horizontal intervals and little pruning is necessary. If you have a grafted tree, the basic rule of thumb of removing any shoots below the graft is important. Grafted trees will be smaller than seedling trees and it would be of some merit to prune the top out to keep them small for picking fruit, which is not an easy task at 30 metres. Irrigation in our Australian climate in a particularly dry season is essential, as dry period will cause leaf defoliation and fruit drop. It is beneficial to irrigate and provide heavy organic mulches if possible. Never put mulches and fertilizers too close to the trunk as, especially with mulches, root rot is a problem in Mamey and Green Sapotes. They are very hardy plants and don't have many diseases if they are grown under ideal conditions. However, the greatest problem we encountered is different types of fungi. Root rot problems and collar rot are common and anthracnose, sooty mould and rusts have been observed. Insect pests such as scale, spider mites and swarming beetles have been recorded but they are easily controlled with normal horticultural practices. Other problems that may crop up are flying foxes, bats, birds, rats and finger blight (that's your neighbour!). With the harvesting of these fruits, it's quite common to see a number of different crops on the tree at the same time, as they take anywhere from 12 months to 2 years for the crop to ripen. The largest fruits will ripen first, obviously, and the common method of determining whether they are ripe is to scratch the shoulder of the fruit. If the flesh underneath is green, do not pick, but if the flesh is turning pink or salmon-coloured, you can pick it and it will remain hard for a few days then ripen quite successfully. They have a very good shelf life if you know exactly when to pick them. The crop that flowered at the same time will also ripen almost at the same time, so it is not necessary to scratch each individual fruit. Just harvest the whole particular crop when you determine the fruit is ripe enough. Picking is obviously by hand, quite laborious, and you either cut the fruit or twist it off the branches. In the post-harvest aspects of these fruits it is important that you don't mark the skins of the fruit, so that they will arrive to the consumer in prime condition. Try not to sell the ones with your fingernail scratches on them. As they are such a heavy, dense, big and strong fruit, it is important that you have good strong boxes and you pack the fruit correctly. You can tell when the fruit is ripe when it becomes soft and a beautiful aroma, similar to almonds and marzipans, comes from it. They are extremely rich fruits, very sweet, a texture similar to avocados; it is very difficult to eat a whole fruit, it is that sweet and rich. Central and South American inhabitants and especially the Cubans go absolutely crazy over this fresh fruit and I would like to read you a little story that came from the Rare Fruit Council News from the International Body about Mamey Sapotes. It was billed "The Hour of the Mameys" but it was all over in fifteen minutes at the Sunset Strip Plaza on Sunday. "That was all the time it took for old developer Raphael Kaboutsen to sell 500 pounds of the fruit, a rough-skinned oblong Caribbean treat, the size of a large mango but with a sweet, juicy red pulp that is passionately loved by the Cubans. The limit was one per customer but at 99¢ per pound, one quarter of the growing price, whole families lined up to get the precious fruit that is a rare and exotic find in Miami. Kaboutsen sold out the initial batch in the first 15 mins and had to make desperate retreats to his 30-acre farm to get more Mameys. He went back three times and then had to turn 100 people away. It shows that there are people who would do anything for this fruit." I personally think it has the greatest potential in Australia as a flavouring in ice creams, milk shakes. I feel it will rival chocolate as one of the best flavouring in the world. It is nutritionally an excellent fruit, high in carbohydrates, reasonably high in proteins per fruit and the seeds are often milled to prepare a type of bitter chocolate. Both the Mamey Sapote and Green Sapote have a great future but as with many new products it has to be promoted and marketed properly. I have yet to meet someone who likes ice cream who doesn't like Mamey ice cream. Q. Will some Mamey Sapotes not fruit at all? A. Yes, that is possible. It could be possibly for a number of reasons including pollen sterility or pollen incompatibility with the neighbouring plants, if they are grown from seeds. Q. Will they all flower though? A. Yes. I've never known one not to flower. Reports from overseas is that they can take up to 12 years to flower but we have seen them flower in 4 years in Australia. Q. When you graft your Green Sapote back onto your Mamey Sapote will it lower the cold tolerance of the Green Sapote because of the Green Sapote coming from the highlands and should have a higher resistance to cold and the Mamey from the lowlands should be more of a tropical tree? A. I don't know. I do know that the Green Sapote is a more sub-tropical tree but I don't know the difference on Mamey rootstock. When the Mamey is fairly big it can handle a couple of degrees of frost but it doesn't like it. Q. When I bought my Mamey Sapote I was told that I should leave the fruit fall to the ground and it would be ripe then. Is that advisable? A. If it's a home garden and you are not worried about pests getting to it, that is a reasonable way to having ripe fruit. But you would need to have mulch at the base of the tree so that the fruit won't get bruised. Q. At what age do they bear? A. A seedling will bear anytime from 4 to 12 years and a grafted plant generally from 2 years on. It also depends on the variety. Magana will bear at less than 2 years from the grafted time and the Pontin often takes 4 to 5 years. It varies. Q. What is the productivity likely to be with the Green Sapote as opposed to the Mamey Sapote from a commercial standpoint? A. I'm sorry, I can't give you an answer on that. I've seen Green Sapotes with very good crops, up to 200 kg I would say. Q. Where can we get grafted trees and how much? A. A number of nurseries are beginning to produce these trees. I think Fitzroy has some and they are available up my way (Cairns) in small numbers. I think Mamey Sapotes go for $25 and Green Sapotes for $30. Actually one of those trees went for $92 in Rockhampton a couple of weeks ago in the auction. Article extracted from "Proceedings of First Exotic Fruits Seminar" 14-15 Feb.1987, Mackay Qld. 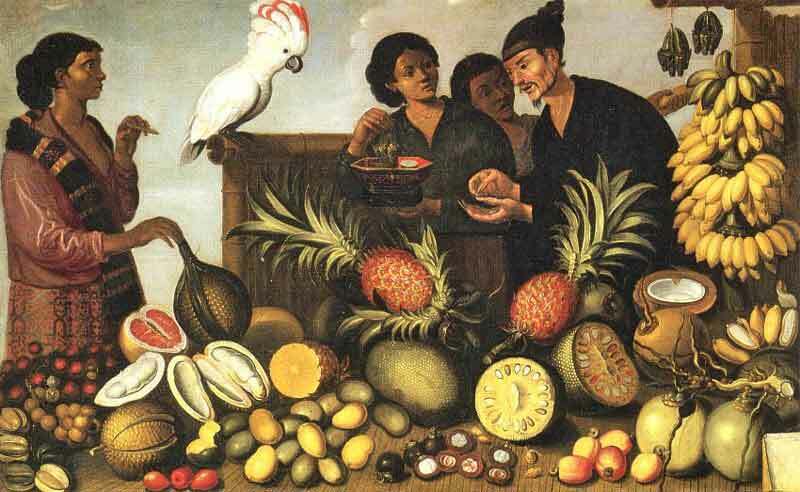 Above: Albert Eckhout (attributed), 'Market Stall in the Indies' (mid 17th century), Rijksmuseum, Amsterdam. This painting exemplifies the Dutch view of the tropical East at the time of Tasman's voyages to Australia. (I thought other members of the RFC of A might have as much fun as I, identifying the fruits portrayed and of dallying with memories of markets and tastes. The fruits look top quality and ripeness. Love to see more variety down south.